In an age where bands and groups are reforming for 'one-more-gig'-type headlines, it's gratifying when you see a proper act get themselves back together again. Shaun Ryder has engineered just such a move by gathering up his Black Grape musicians for 'a very special party' at Easter. Fresh (fresh - you sure?) from the New Years Eve party held at the O2 in Brixton, the Get Loaded In The Dark / Park express rolls back into town on April 1st with Black Grape as part of the soon-to-be-announced line-up, this time performing at the Coronet Theatre. Limited "Saver" tickets are on sale now and cost £15 (plus fees). 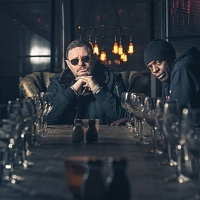 Black Grape were formed in 1993 by Ryder and Bez after the Happy Mondays ran their course. They chalked up (oops - Freudian slip) a handful of hits including 'Reverend Black Grape', 'In The Name Of The Father' and 'Kelly's Heroes' (all of which featured on the number 1 album 'It's Great When You're Straight, Yeah?'). Although their second album, 'Stupid, Stupid, Stupid', nose-dived critically and commercially, the group consistently mixed indie, rock and hip-hop using the talents of other members Danny Saber and Kermit and are still held in high esteem by those who saw them 'live' before. Their last gig was in 1997 so this return will be an emotional one.